Sadly I got snowed in Thursday, and after hiking 2 miles through snow to a station that was closed (people were telling me on the way it was closed!) I decided to turn back and spend the rest of the day with the family. Friday was different, and through taking 2 busses I managed to get to a peripheral station heading in to London and to conference utopia! Using a checklist (no I still haven’t sorted that out yet, I usually book a room with a 15 min buffer and then prepare it as I see fit – prime directive, columns on board, old tasks etc… before the team arrives). Not using the Good/Bad columns, this suggestion was made because it tends to polarise the teams and can affect how people contribute to the session. Allowing more time for the actions at the end. Rachel used a diagram to explain that part of the meeting is looking back and part of the meeting is looking forwards to the next sprint/iteration, so 50% of the time for actions is not a bad idea. Actions taken can actually be further broken down into smaller pieces so they can be scheduled into the next sprint/iteration. “Tell me how you measure me and I will tell you how I will behave” (Eli Goldratt), this in fact is my favourite point of the whole session, and it took a while to for me to get it! It can be applied in a whole number of different ways. For example, if you measure the number of tasks done, people will create lots of tasks, and then focus on the number done perhaps as opposed to the priority. Another example – if you are recording bugs fixed, then maybe people wont be too careful about preventing them because they can be fixed. Its the difference between delivering value verses ticking a box in a way that value doesn’t have to be delivered. Management processes with budgeting at their core are not neutral in their management, ie. budget drives decisions not value driving decisions. We then had lunch followed by the Open Space Unconference Sessions facilitated by Rachel Davies. I have never been part of an Unconference before, and to be honest I was a tiny bit unexcited about it. However it turns out that it is based off feedback from previous conferences where attendants reported that the “coffee time” where they networked and spoke to others in the industry was in fact the best time for them as they were able to share and discuss their challenges and find solutions to their individual problems. Unconference works by interested people placing a “topic” up on the board randomly choosing a time and a location and then attendees examine the board and chose a “topic” from those posted to attend. Its very open, and attendees can be like bumblebees and go from one to another if many are being held at the same time, or they may wish to stay with a particular topic. The only rule is that the originator must stay with their own “topic” for the duration. 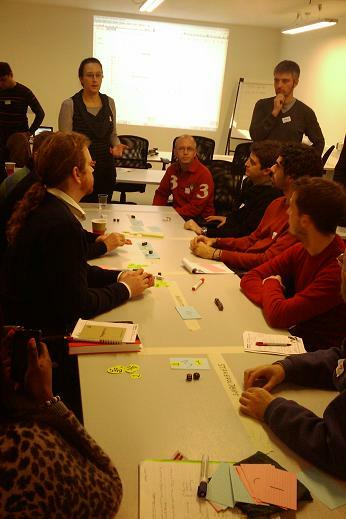 One of the “topics” I went to involved the playing of a software development “game” using dice to determine software completion and bug introduction and was run by Liz Keogh and Jon Jagger. Good fun to watch! Overall an excellent day, sadly I had to get back home (weather) so I missed out on the pub. Perhaps next time! For those who have never been its definitely worth a look, and for those who have gone, well the feedback for those I secured tickets for was extremely positive! 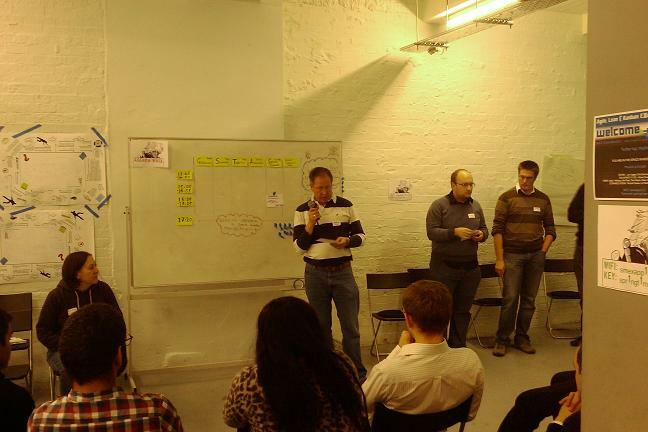 This entry was posted in conference, Core Agile, kanban, lean, skillsmatter. Bookmark the permalink. Great to hear you enjoyed it! Hope to see you back at some of our other events some time soon.